Through dance workshops and performances within schools and the community we aim to develop an awareness of the traditional and cultural ethos of India which will reduce any negativity or prejudice and develop an understanding of the world we live in.The participants are offered an experience that will enhance their self esteem, confidence, knowledge, team spirit and mutual respect which in turn will help break down cultural barriers and encourage racial harmony.​Pushpanjali Dance Company offers school workshops that provide students and teachers an opportunity to experience and enjoy various dance forms of India which enhances an appreciation and awareness of other cultures and dance forms. Students will be taught dances from different regions of India as part of the geography curriculum which will enhance their knowledge of Indian art and the cultural diversity within India.Students can also learn about Indian lifestyle, food, costumes etc through our lecture demonstrations. Hinduism: Students will learn about the hindu philosophy, beliefs rituals and religious practices which will further enhance their understanding of the hindu faith. Hindu Mythology: Students will learn about Hindu Gods and Goddesses through fascinating stories such as Ramayana’ the story of ‘Rama and Sita which is one of the greatest epics of India as well as other stories of deities such as Ganesha the elephant headed God, the Hindu Trinity Brahma, Vishnu and Shiva, Durga the Goddess of strength and many more captivating stories. Hindu Festivals: Students will learn about the significance of celebrations during Diwali, Holi,,Navaratri and other festivals that are celebrated by hindu communities all over the world. We work in partnership with schools on projects enhancing students’ creativity. Artists from the company could plan, choreograph and train students for dance productions. 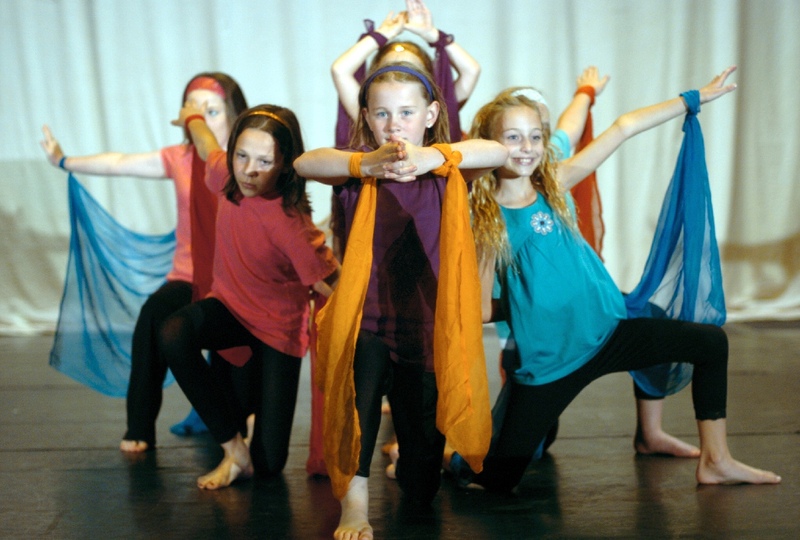 Students are engaged in a fun filled ‘dance and fitness’ workout using energetic and exciting dance routines that are a fusion of movements from different genres such as Indian classical, folk, modern, hip-hop, bollywood and yoga. These unique dance routines are suitable for all ages and abilities and are guaranteed to get your body moving, heart racing and feet tapping. A two week residency project with Cheshire rural touring mini network, offering story telling workshops in 10 primary schools narrating ‘Animals Stories’ especially for Early years, Foundation years and key stage 1 children. A partnership project with Fallibroome High School and 5 feeder primary schools involving 60 students during their Arts Week in Feb 2006, where I created and choreographed a dance production to show the effects of the Tsunami and the strength the victims gained from the world and from within to rebuild their lives. A dance project involving many Oldham High schools highlighting integration done in partnership with Integrate Arts. Dance and Wellbeing Project: Prajyoti conducted dance workshops at Salford University for the Health & Wellbeing Expo. Indian dance and music were used at Mytham Primary School to help children of Key Stage 2 to understand the effects of the Tsunami. 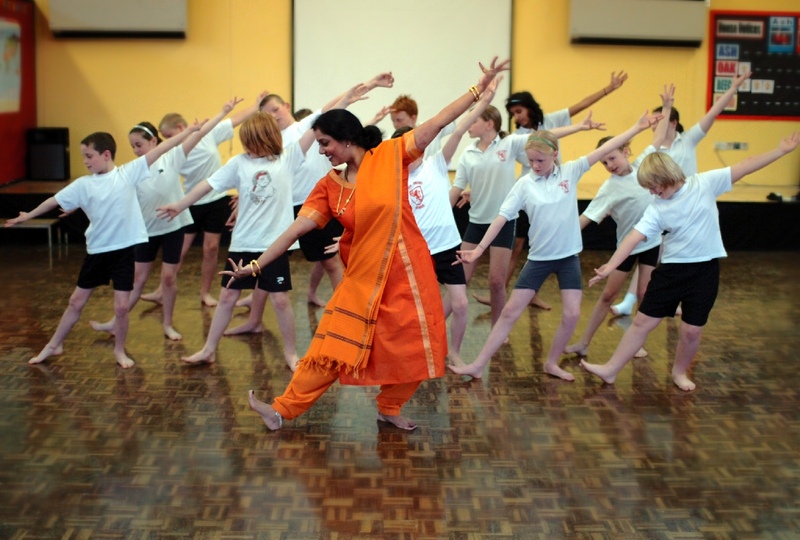 Students of A – Level at Poynton High School did a course in Bharatanatyam which gave them a better understanding of this Dance form, and helped them to improve their choreography and creativity. Research was conducted in two primary schools in partnership with Artists in Schools to see the benefits of Indian Dance and storytelling on the reading, writing and narrative skills of children in Key Stage 1. In India dance is an inseparable component of the cultural fabric of society. Dance is an expression of celebration and joy and is performed on all auspicious occasions. The general festive ethos of different communities and regions in India change with different occasions like the harvest of crops, weddings and various festivals. Tracing through the centuries of the rich heritage of India’s art, one goes back into a world where reality and mythology are impossible to separate. Bharatanatyam which is an acronym composed of the first letters of bhava meaning expression, raga meaning melody, tala meaning rhythm and natyam meaning dance is an ancient and traditional classical dance form which originated more than 3000 years ago in the temples of southern India. The essence of these dances lies within traditions and mythology where stories of Indian Gods and Goddesses are brought to life through the narrative element of storytelling using beautiful hand gestures and facial expressions. The highly sophisticated art of Bharatanatyam has been handed down through the centuries by dancers in the sacred environment of the temples where dancers developed and propagated their traditional inheritance. 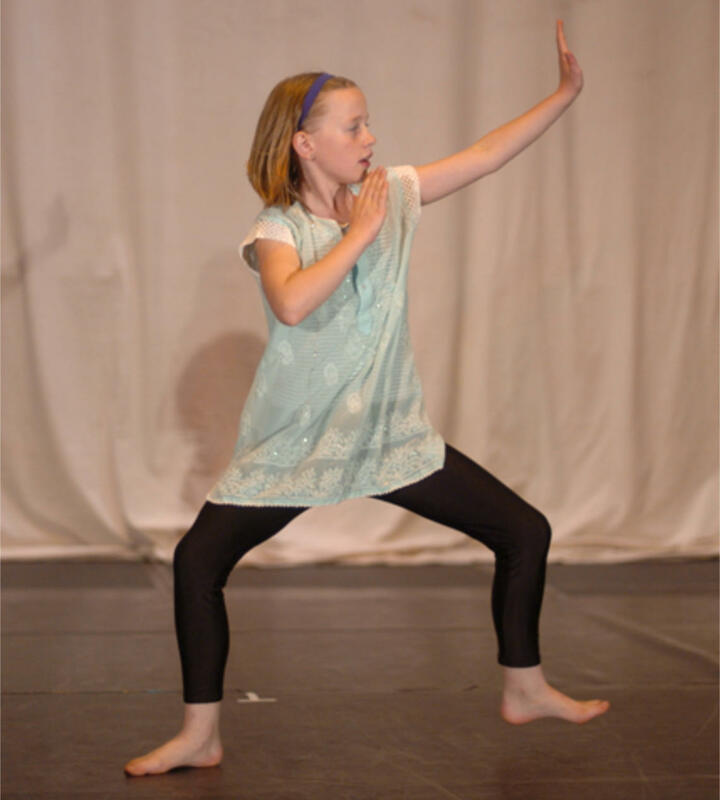 Bharatanatyam training takes seven to eight years under the guidance and tutelage of the teachers. Although rendered essentially as a solo dance, there is a trend these days to present Bharatanatyam in group formation. Traditionally Bharatanatyam was used to depict stories about Indian Gods and Goddesses but today it is used to narrate stories from around the world and this has popularised this art form and developed audiences everywhere. This dance form is accompanied by south Indian music known as Carnatic music. The instruments used are the drum, violin, flute, cymbals and a string instrument known as the Veena. The costume is made up of silk in vibrant colours with contrasting and golden borders. The costumes are made up of a number of tailored pieces to help the dancer carry out complex movements with ease. It is stitched by specialist tailors which is a skill usually passed on from one generation to another. The dancer also wears anklets, usually consisting of thirty to forty bells on each ankle which makes the rhythmic footwork audible. Jewellery is an essential part of the costume where the dancer wears many pieces of jewellery including necklaces, bangles, rings, nose rings and special ornaments for the head and arms. Bhangra is a lively and energetic folk dance that originated in State of Punjab in the North of India. Punjab which means the Land of Five Rivers is the cradle of the Indus Valley civilisation and is more than 4000 years old. Due to Punjab’s rich and fertile agricultural land, it has been invaded over the years by Persians, Greeks and Mughal empires. Punjab is called the Granary of India and India’s Bread Basket since two-third of the food grains procured annually in the country is grown in this State. Wheat is the main crop grown here along with rice, cotton and sugar cane. The people of Punjab are called Punjabi and they are very proud of their culture, land, music and dance. Bhangra is traditionally performed during the harvest season and is associated with the festival of Baisakhi which is the harvest festival. Bhangra is perhaps the most virile form of Indian folk dance and it reflects the vigour, vitality and the hilarity permeated among the folk by the promise of a bumper crop. The Bhangra season starts with the wheat sowing and every full moon night the villagers get together and young men dance for hours in the open fields. The dance usually starts with a slow speed but then gradually the tempo of the dance increases to dizzy heights. When the crops ripen and are ready to be harvested, the farmers rejoice and celebrate and celebrate with Bhangra which is known as the King of folk dance in India. Over the years, Bhangra has enjoyed a surge in popularity worldwide, both in traditional form and as a fusion with genres such hip-hop, house and reggae. It has evolved into a fashionable style of music and dance and is enjoyed by people not only in South Asia but also in many parts of the world. Traditionally men wear a lungi, which is a colourful piece of cloth wrapped around the waist with kurtas which is a long Punjabi style shirt. They also wear turbans to cover their head. Women wear the traditional Punjabi dress known as salwar kameez which is a long colourful shirt with baggy trousers. They also wear dupattas that are long pieces of material draped around their shoulders. many different Punjabi musical instruments contribute to the sound of Bhangra. Although the most important instrument is the Dhol which is a large percussion instrument, Bhangra also uses a variety of string instruments along with smaller drums. Garbha is a folk dance from the State of Gujarat. Traditionally this dance is performed either around a clay lantern with a lamp inside it called the Garbha Deep or an image of Goddess Durga as an object of veneration. The lantern represents life and Goddess Durga, the feminine form of divinity. Garbha is celebrated during the festival of Navaratri, which lasts for nine days. This dance is one of the most popular folk dances performed not just in India but all over the world. Garbha songs are usually based on Lord Krishna or the nine forms of Goddess Durga. 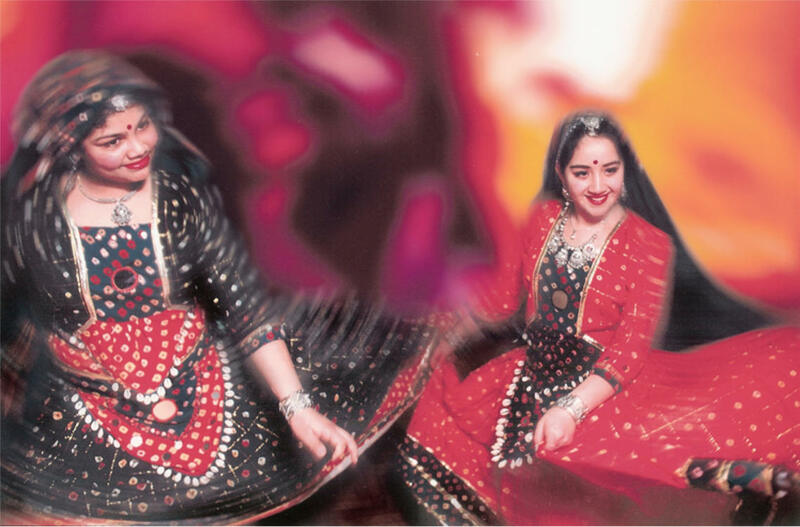 The style of garbha dance varies from place to place within Gujarat. The most popular form of garbha is the Dhandia Raas where the dancers participating in the Dhandia Raas carry small decorated wooden sticks which are stuck to a rhythmic beat. This rhythmic striking of the sticks has a symbolic meaning that has been derived from the culture and legends of Gujarat. The dancers swirling round in circles with their dhandia sticks represent the warriors in battle between Lord Rama and the demon king Ravana from one of the greatest the epic tales of India The Ramayana. The costumes worn by both men and women are very colourful and vibrant. The women wear a three piece dress known as Chaniya choli which is embroidered in bright colours and decorated with beads, mirrors, stars, shells etc. They also wear lots of jewellery like beautiful necklaces, large earrings, colourful bangles and anklets. Men too wear a traditional costume that is embroidered with intricate patterns. Bollywood is the Indian film industry based in Mumbai. Bollywood produces the maximum number of movies in the world per year. Most of the movies are musicals with lots of songs and dances. Danny Boyle’s award winning movie Slumdog Millionaire and Andrew Lloyd Webber’s musical Bombay Dreams have popularised bollywood dances not just in the UK but all over the world. Bollywood dances are enjoyed by people of all ages as they are fast paced, entertaining and exciting. Bollywood dances are usually choreographed to suit the theme and music of the movies which offer choreographers an opportunity to explore their creativity and imagination. The dances do not adhere to any particular style or genre but are a fusion of various dance styles from all over the world be it classical, folk, tap, modern hip hop or jazz. This is a dance style that is enjoyed by all communities where the dances have a combination of classical, folk, modern and hip hop styles that are fused together to create exciting and entertaining dances.